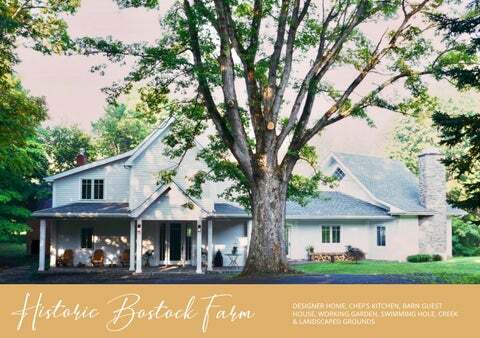 Welcome home to your Catskill Estate Are you looking for a forested sanctuary only 2 hours from New York City and also at the cultural and creative epicenter of the Catskills? Imagine yourself in this magnificent mountain setting in a stunning 4+ bedroom Main House with a 2 bedroom Barn guesthouse for friends and guests. 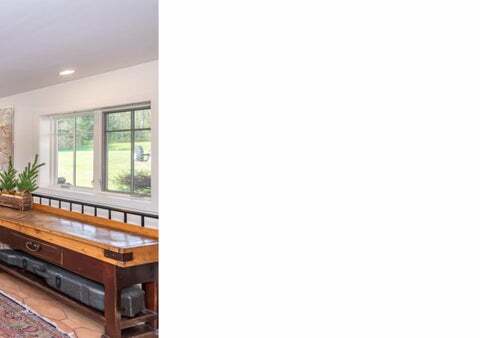 This gracious estate which was originally a farm established by Reverend Samuels in 1836, features two full homes, both which have been completely renovated and modernized to the highest level. The Main Houses features a magnificent chefâ&#x20AC;&#x2122;s kitchen, eco-sustainable architecture and engineering, fullhouse generator and a total of over 5500 interior sq feet of light-filled bedrooms and entertainment areas and the Barn has been completely rebuilt with radiant heat, a gas fireplace and oversized picture windows and doors. Enjoy your own private waterfall and stocked pond on park-like grounds and pick organic berries and fruits from trees which have been abundantly planted throughout the estate. Bask in the warmth of the stone and gas fireplaces, radiant heat and relax in the geothermal cooled home in the summer. You will have complete privacy in this mountain enclave which is surrounded by 100 acres of forever protected forests and streams. Nestled on a park-like estate with mature trees, flowing streams, and a landscaped swim pond stocked with trout, surrounded by 100 acres of protected land. Spectacular new Chefâ&#x20AC;&#x2122;s kitchen with marble counters, Sub-zero appliances, rare La Cornue professional range. The Main House has 4 spacious bedrooms with views, including a master suite, 3 guest-rooms, TV dens, windowed playroom, a gym and 3 tiled full baths. 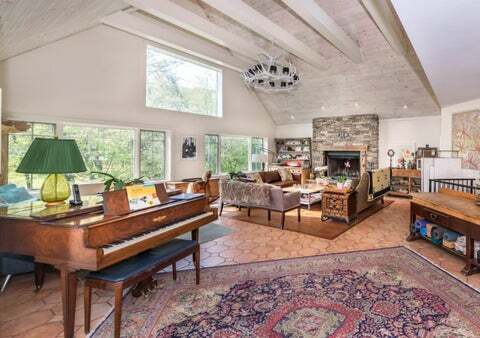 It also has a large dining area, a spectacular Great Room with a soaring cathedral ceiling and wood burning fireplace and an expansive outdoor deck with a stunning view - perfect for grilling and hosting family occasions. The Barn Guesthouse The barn guest house offers an enormous master bedroom with sitting area on the 2nd floor loft as well as a first floor bedroom, full bath, open plan kitchen dining area, greatroom, and spectacular views. The Estate Grounds Enjoy four seasons on your own park lawns with planted fruit trees, planted vegetable garden, play area, meandering mountain streams, backyard forest with original farm stone walls - perfect for a private campground! Things to do From the front and rear playing fields enjoy breathtaking views of snowy peaks and brilliant autumn foliage on the surrounding mountains. Or you can just stay home and lounge on the spacious and sunny back deck or by the large stone fireplace in the Great Room and listen to music or read quietly on the shaded front porch. During the summer months there are several wonderful camps and summer schools in the area where children of all ages can attend a great range programs. One mile down the road there is beautifully maintained Avery Park with tennis and basketball courts, soccer and baseball fields, and a new childrenâ&#x20AC;&#x2122;s play area and play set. Within a 10 minute drive on Route 28 is the Emerson Resort, a five-star lodge with restaurants, shops and a luxurious spa where you can spend the day being pampered or explore the park grounds and river banks. Local farmersâ&#x20AC;&#x2122; markets, great restaurants, all stores are 5 minutes away. Hiking and skiing are 20 minutes drive on main roads. The nearby Ashokan reservoir park has expansive waterviews and a beautiful path for running and biking. Fly-fish for trout and bass on the reservoir and Esopus river, where you can also spend the day swimming and rafting. It is an ideal retreat for families or individuals who want nature, music festivals, art venues and a place to escape.